Desalination has evolved into a desirable water supply alternative by tapping the largest reservoir in the world - sea water. The technology, available for decades, is at work in many arid areas of the world including the Middle East, the Mediterranean and the Caribbean. ​The Carlsbad Desalination Plant is currently the largest of it's kind in the Western Hemisphere. ​A 30-year Water Purchase Agreement is in place between the San Diego County Water Authority and Poseidon Water for the entire output of the plant. The plant has been delivering water to the businesses and residents of San Diego County since December 2015. Poseidon Water is a water project development specialist that identifies, develops, owns, and manages large water infrastructure projects. Learn more on our Who we are page. From the plant located on the Aqua Hedionda Lagoon in Carlsbad, California to the pipeline, learn all about our facility and find high-res photos at our What we do page. The road to desalination has been a long and fascinating journey. For a look at the story visit our How we do it page. What it is: state-of-the-art seawater desalination plant and 10-mile water delivery pipeline. First envisioned: mid-1998 by local officials including Claude "Bud" Lewis, the then mayor of Carlsbad. State, regional and local water plans all have confirmed that immediate and pressing water needs cannot be accomplished without significant investment in seawater desalination. The plant provides 56,000 AFY of new water supply for the San Diego region. A region where nearly 85% of the current water supplies are imported. The CA Department of Water Resources’ 2009 Water Plan Update identifies the need for 275,000 AF of desalinated water by 2025. The Metropolitan Water District of Southern California’s Integrated Water Resources Plan identifies a need for 150,000 AFY of seawater desalination (including 56,000 AFY from the Carlsbad project) by the year 2020. 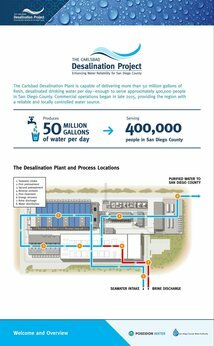 The San Diego County Water Authority’s (SDCWA) Urban Water Management Plan identifies a need for 56,000 AFY of seawater desalination from the Carlsbad project. The Carlsbad City Council found that “the desalination plant serves an extraordinary public purpose. Provides a local source of high quality drinking water to supplement imported water supplies. Improves water supply reliability and quality. Complements local and regional water conservation and water recycling programs. Provides the only water supply in San Diego County that is not dependent on snowpack and rainfall. Excels as the first water infrastructure project in California to have a net carbon of zero.